Prayer is essential and integral to rural life and its approach to health and illness. In some areas, there are prayerists who are asked to invoke on behalf of the ailing for their healing needs. Many forms of rural alternative therapies utilize prayers in some form or another. To the hilot or the arbularyo, this may be in the form of a written prayer, ORASYON or a whispered prayer, BULONG. A bulong is usually whispered during the course of the healing or manipulation. Or, the healer might prefer to use an ORASYON, a written prayer usually scribed on a piece of paper or cloth, preferably wet with saliva and applied prayer-side to the area of pathology (see:Rabies). Similar prayers may also be written directly on the skin while being whispered. For some gastrointestinal ailments, the orasyon may be rolled and placed in a glass of water, and the infusion given to the patient to drink. The prayers, invariably in Latin or pig-Latin, are also often used for countering evil spirits or preventing physical harm or as an added ritual to many mundane events. There are specializations in the albularyo system. Some may be more knowledgable or better versed in one modality than another, some more capable to dispense herbal treatments, massage (hilot), or counter spells for kulam or sorcery. And for bulongs and orasyons, its ministration is considered to be more potent and more likely to be effective if dispensed by a healer versed in that modality, especially those empowered by "anting-antings" or amulets. However, its use isn't the sole purview of arbularyos or healers. Quite often, after achieving a level of familiarity and trust, many of the rural folk will easily admit to using these prayer-forms for day-to-day maladies such as headaches, hiccups, burns, sprains and back pain. Some refuse to share these prayers for other to use, believing it will lessen its healing potential; some frequently share them with kinship and friends. Some prayers are more favored than others, believed to have generic or universal application, not uncommonly, memorized and ready-to-use for whenever the need should arise. The others are kept in a "libreta," tucked away in some secret shoebox, and usually handed-down to a family member. Some believe that these oraciones can paralyze an opponent (pamako), make one invisible to the enemy (tagabulag) or make one invincible to bullets or bolo cuts. It is also used for exorcism, as a love charm, and for protection from physical dangers and evil spirits. Sometimes, orasyons written in small pieces of paper are rolled into small tight wads and placed into the cavities of dental caries. Bulongs and orasyons are still in popular use by healers in the southen Tagalog areas. 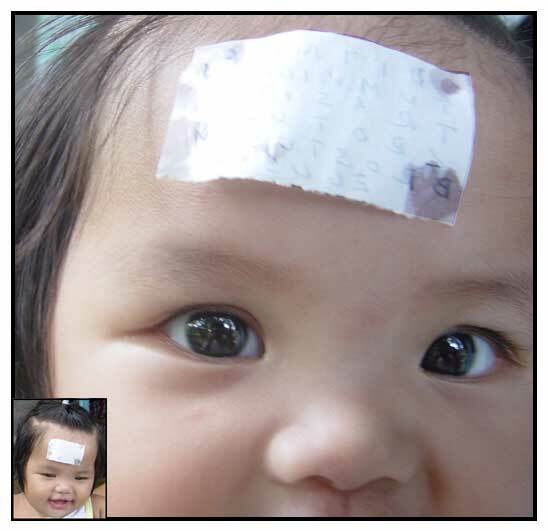 Young child with an orasyon patch on the forehead placed because of protracted hiccups. Scribbled onto the patch is a prayer in pig-latin. The user has found it to be the most effective in her armamentarium of prayers, orasyon or bulong. TO AVOID ILLNESSES: ESTO MIHI, UMBRACOLU, ET MEDECINAM, ET ANEMAE. FOR VARIOUS ILLNESSES: ECCECRUCEM DOMINE, FUGITE PORTIS AD VERCE, VINCIT LEO DE TRIBU, JUDA DAVID - ALELUYA, ALELUYA, ALELUYA. FOR SPRAINS: QUEM QUAERITIS SUSUBANI, EGOSUM HOMOMAULI ANG SIRANG BUTO, CRIATUM, HOMO QUIS LOVEL, PHU, PHU, PHU. FOR FOREIGN MATTER IN THE EYE (PUWING): (1) RICOTITAM MASUR RISURBO (B) JESUS PERETUINO ULIMARES GIGLER YLAPUS. 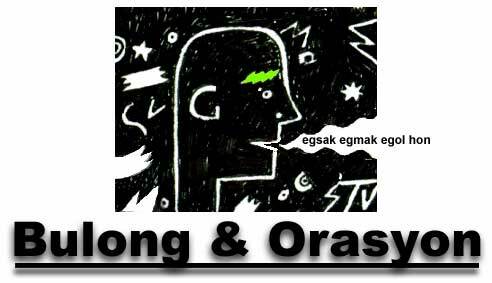 FOR MOUTH SORES (APHTHOUS STOMATITIS): (1) MAMONGLAY BARDUCAMIN YCAR BATUR CAR-CAR. (2) OH VIRGO VIRGEN MARIA OPICLUM, JESUS MARIA MAMAHEN. FOR BACK PAIN AND SORE THROAT: AMAM SANCTUM, AMAM TACA, AMAM SABAB. FOR TOOTH EXTRACTIONS: DOMINUM PAULUM, WINGIM CARLIM, HIBLIM. FOR SPRAINS, BULONG WHILE MASSAGING: MADMED, ACBIUS, ROUDAE. FOR BURNS: SALU AREPO TONAPE EROROTA.